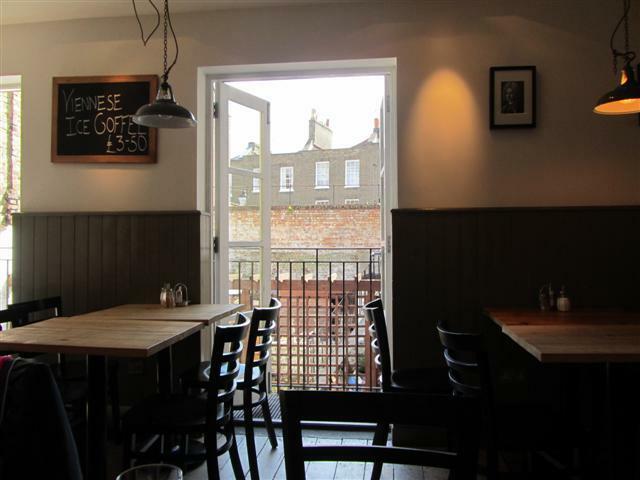 For something a bit different, head to Kipferl, situated in the quirky Camden Passage. This Austrian/Viennese cafe has a relaxed feel to it. The cafe area is at the front and the small restaurant area is at the back. The cake counter divides the two areas. The restaurant area is casual too. There are a few seats outdoors. The staff were friendly and gave service with a smile. They were great at recommending dishes, so that we had enough to share but were not over ordering. The spinach dumpling sounded interesting but we weren’t sure whether to have it as a starter or to have it as a second main dish. It was good that the staff said that the starter portion to share would be enough, even though you only get one dumpling. If we had ordered it as a main, then we would have been struggling to have room for some of the other food and drink. 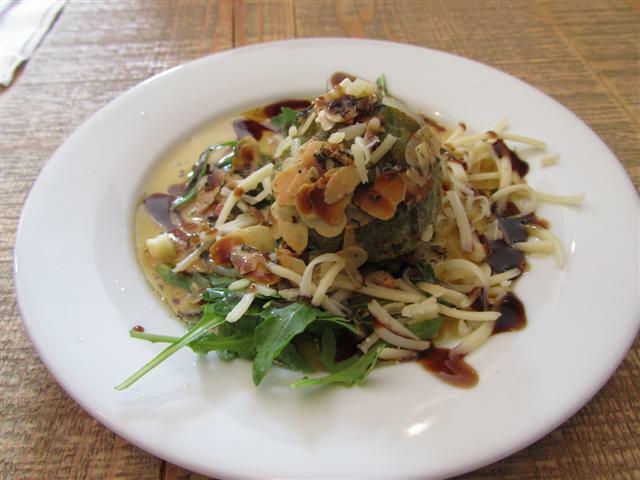 The spinach dumpling was topped with toasted slivers of almonds and grated organic mountain cheese. It came with brown butter and a green leaf salad. The dumpling itself had a strong flavour and it was quite stodgy, in a good way. The crunchiness of the almonds, the softness of the dumpling and the cheese strands went really well together. 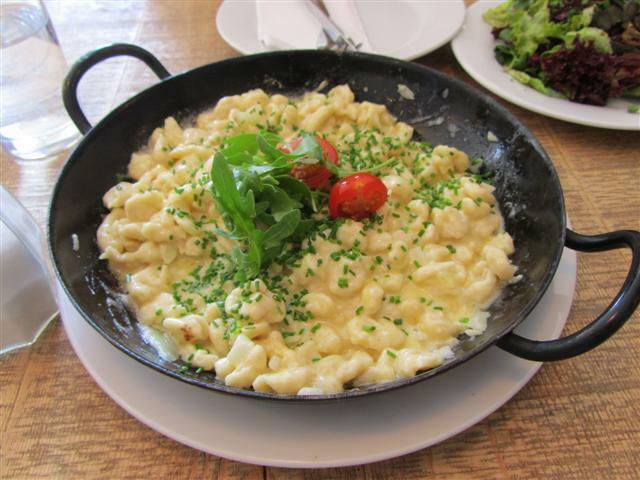 The dish of Kasespatzle was presented in the iron skillet that it had been cooked in. It was a good portion to share. The menu described this dish as pan fried noodles. As it said noodles on the menu, I instantly imagined that it meant noodles of the Chinese variety. So, I was surprised when our dish came out and it was more like a pasta dish. Saying that though, it was a fantastic creamy dish. It reminded me of a macaroni cheese in its texture and had that rich taste of cheese going through it. The Kasespatzle came with a green salad dressed with pumpkin seed oil dressing. 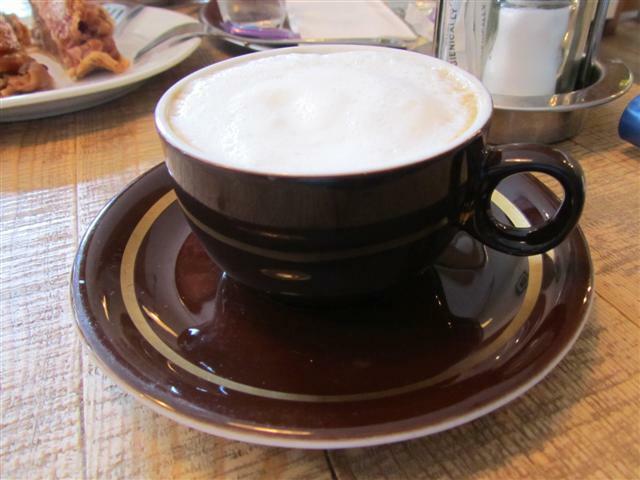 Coming to Kipferl would not have been complete if we did not try their cakes and coffee. The coffee was slightly bitter to what I prefer. I needed sugar with it which is something that I don’t normally add. The apple strudel was delicious. 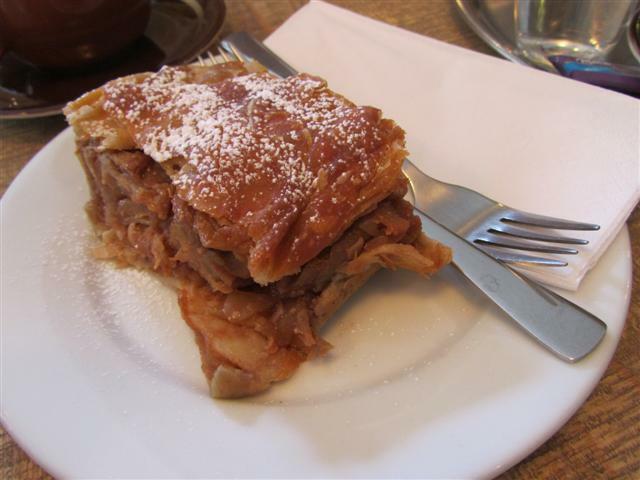 Slices of apple with sultanas all encased in crispy thin pastry. 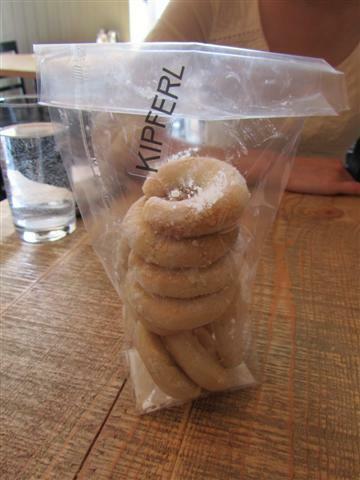 If you fancy something sweet to take home with you, then Kipferl do serve their cakes and biscuits for takeaway too. They also have other Austrian delights such as chocolate, pumpkin seed oil, pickles and wine on offer. My partner and I visited Kipferl over the weekend and were extremely impressed. We too had the Spinach dumpling to share as a starter and yes just one dumpling was enough. We both had Schnitzel, one Veal and one Chicken, and they were as good as the Schnitzels we had in Austria. Also the Cafe Melange was spot on. I’m glad we booked a table because it was so busy and people were queing the entire time we were in the restaurant. Without a doubt we will be going back at some point. Thank you so much for this tip. The food looks amazing and seems very authentic.